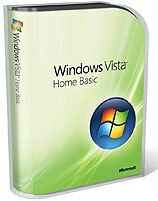 Windows Vista Home Basic (HB) is a flavor of Windows Vista offerings from Microsoft, which intends for use at home based desktop or laptop computers with basic computing needs. Windows Vista HB edition has most of the base enhanced features and functionality in areas such as security, stability and performance. However, it lacks tools and features that will make using the computer more easy, fun and entertaining, such as Windows Media Center, Windows Movie and DVD Maker, Windows Aero Glass interface and etc. You will need third-party programs or applications for most of the tasks you want to perform in Home Basic Vista. Check out the Vista features matrix for what is included in each version of Vista. All inconveniences for the advantage of cheaper price. Beside that you can only in-place upgrade from Windows XP Home edition to Windows Vista Home Basic, and you cannot fresh install Windows Vista HB directly with upgrade license. CNet (link dead) reviews Windows Vista Home Basic and concludes with a very good editors’ rating of 7.0 out of possible 10.0 that Windows Vista HB does improve some features within Windows XP, has fewer system crashes than Windows XP and offers better built-in support options. However, Windows Vista Home Basic does not put Search on the desktop (it’s buried within applications, within the Start Menu), no Aero graphics system, no new software yet written exclusively for Windows Vista, and it’s optimized only for the Microsoft Windows ecosystem (for example, RSS feeds from IE7 get preferential treatment). Most important of all, there is little reason to leave Windows XP. Windows Vista Home Basic is essentially warmed-over Windows XP, Windows XP SP3. If you’re currently happy with Windows XP SP2, we see no compelling reason to upgrade. On the other hand, if you need a new computer right now, Windows Vista is stable enough for everyday use.